Created by Raven Elyse, Raven Elyse TV offers a dosage of beauty and style tips along with stories and a reality TV segment that gives an inside look at the lifestyle of a full-time YouTube Vlogger. Over time, Raven has been able to bond with her followers, developing an online community of like-minded women. She is one of the first YouTube content creators I've seen film moments of their life on a day-to-day basis with weekly videos (a series titled Ray's Week), and her wonderful personality immediately caught my interest. I had the opportunity to ask Raven a few questions about her vlogging career and the overall vision behind her brand. Check out the interview below and find out some challenges Raven faces + how she stays focused to overcome them! victoriadrianna: Thank you for taking the time to share your story with DARLA today... To start off, could you tell me a little bit about yourself? Raven Elyse: My name is Raven Elyse. I’m a 22 year old YouTube Vlogger/Beauty Brand Ambassador. I have a 6 week-old daughter who is the light of my life, and we live in Austin, Texas! V: What inspired you to start your YouTube channel? How did you go about learning how to film/edit/produce content? RE: I started filming myself way back when I was about 13 years old. My younger sister and I would create silly skits and just laugh at ourselves in the footage! I always had an interest in filming and editing videos, so I started researching techniques online. When I first discovered YouTube, I was in high school and I loved making all types of DIY creations. People would ask how I made my clothes and other crafts, so I thought maybe video tutorials would be more helpful! I combined my love of art with my love of technology and just went from there! V: What is the mission behind your content? Is there an overall message you aim to send to Raven Elyse TV viewers? RE: “You are not alone.” That’s the most important message that I hope RavenElyseTV represents. The idea that you’re not perfect, but neither am I, and honestly, nobody is. Many young people struggle with a variety of obstacles and often feel as though no one around them can relate to what they’re going through. I remember feeling that way in my teenage years. Everyone else on social media seemed so perfect, and I felt like somewhat of an outcast. I struggled with depression, anxiety, and severe cystic acne. I wanted to reach out to people who might have been struggling with the same issues, and let them know, this is actually more common and more normal than you think. V: At what point did you realize that it was possible to make a career out of your creative outlets? RE: When I first started YouTube, it was just a hobby. I wasn’t earning any money or looking at it as a career. I didn’t even know such a thing was possible! But about three years into it, I realized there was a new market out there for Social Media Influencers. So I perfected my craft while I waited for my opportunity. I watched other YouTubers make a full-time career out of simply doing their favorite hobby - creating videos, and I knew that’s what I wanted to do too. V: Congratulations on your new baby girl… I’ve really enjoyed watching your story with Ziya so far! In 3 words, how would you describe being a new mom? RE: Challenging, Enlightening, and Rewarding. V: From watching your vlogs, I can totally imagine you having your own talk show in the future… You have such a unique personality and you always keep it real! Do you have a specific vision of how you’d like to expand your brand? RE: Thank you! A talk show would be cool in theory, but I don’t think I’m that great in front of a live audience; I still get a bit of stage fright! I really want to continue making online content, but I went to college for fashion design, and my goal is to also launch my own clothing line one day! Then I could integrate my designs into my online content, creating lookbook videos with my pieces and things like that! V: What are some of the most challenging aspects of pursuing your creative career + how do you overcome them? RE: The main challenge is staying organized and motivated when I’m doing everything in solitude. Since I don’t have a team working with me, it can be easy to get distracted or overwhelmed. I try to keep a schedule and treat this career as any other professional career. I set deadlines for myself, keep a budget, and I’m the queen of list-making! Everything must be written down! V: If you could give advice to a younger version of yourself in need of motivation to get started/keep going, what would it be? RE: You never know until you try. As cliché as it is, it’s true. It’s easy to say what you probably “can’t do” when you haven’t even attempted it yet. You have to give yourself more credit and give things a fair chance. You don’t have to be great when you start, but you have to start somewhere to be great! V: DARLAMagazine.com operates as a weekly publication with new articles being published on Sundays to accommodate the lifestyles of busy creatives. How would you ideally spend a free Sunday off from work, with no restrictions? RE: I currently spend my Sunday mornings editing and uploading my weekly vlog series, Ray’s Week. So if I could have a free Sunday, I’d probably just sleep in! To keep up with Raven Elyse's journey, follow her on Instagram + Twitter. 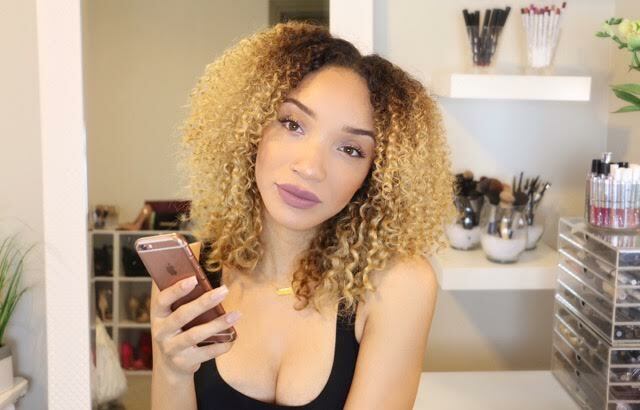 You can view Raven's videos and subscribe to her channel by visiting RavenElyseTVon Youtube!